Analyzing the political consequences of the most extensive corruption investigation in recent Latin American history, Operação Lava-Jato, Media Leaks and Corruption in Brazil answers two central questions about the contradictory effects news media has on political systems. First, how can political actors in a seemingly well-functioning democracy quickly override checks and balances, and replace a head of state with a corrupt vice-president? Second, how can very active news media, while ostensibly performing the role of the watchdog, still fail to deliver media accountability to the public? 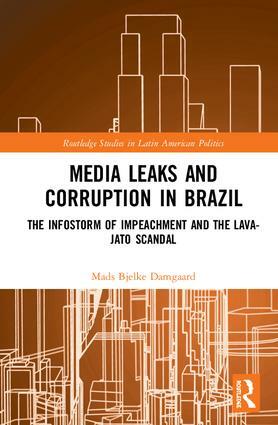 Combining a quantitative view of the media sphere with case studies of the leaks, legal actions, and alliances forming and breaking in the Brazilian Congress, Mads Bjelke Damgaard demonstrates that the media’s attention to leaks and investigations of corruption paved the way for Dilma Rousseff’s impeachment. By timing the disclosure of information in scandals, actors with inside information were able to drive the media agenda and let some scandals escape from the limelight. The book delivers an in-depth study of how scandals become political weapons in a time of media personalities and post-politics. This book will interest scholars of Latin American Studies, and Brazil, and the broader fields of media studies, democracy studies, and journalism studies. 6. Coup d’état or Constitutional Act? Mads Bjelke Damgaard is PhD fellow in the Department of English, Germanic and Romance Studies at the University of Copenhagen, Denmark. He has previously worked at the University of Southern Denmark as well as the Department of Cross-cultural and Regional Studies, Science of Religions Section at the University of Copenhagen. When living in Rio de Janeiro and Brasília, he was visiting PhD fellow with the Universidade de Brasília and has collaborated with the media research group LEMEP (Laboratório de Estudos de Mídia e Esfera Pública) of the state university UERJ in Rio. He has previously published on corruption and Brazil in the King’s College-based journal Brasiliana and the journal Ephemera – Theory & Politics in Society.